Individuals who have participated in the Ontario Health Study (OHS) and provided a blood sample to the OHS are eligible to participate in the Ontario Sleep Health Study. We would like to extend a special welcome to individuals who have also participated in the Canadian Alliance for Healthy Hearts and Minds study. Your participation in the Ontario Sleep Health Study is essential to achieving our goal of understanding better the links between sleep, heart disease and stroke. If you have completed the Ontario Health Study survey and provided a blood sample for it, please indicate your interest in participating in the Ontario Sleep Health Study by clicking here. Alternatively, you may contact Andrew Centen, the study coordinator, directly at 416-480-5143 or ontariosleephealthstudy@sunnybrook.ca. Registration for the Ontario Sleep Health Study is still open. Please note, however, that the Ontario Health Study is no longer accepting new study participants nor are they still collecting blood samples. So, if you have not already completed the Ontario Health Study survey and provided a blood sample, you will not be eligible to participate in the Ontario Sleep Health Study. Wearing a wrist watch-like accelerometer (Figure A) 24 hours a day for 10 days. This tells us when you are sleeping and how well you are sleeping. 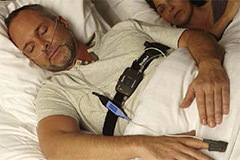 Wearing a simple portable device (Figure B) to measure your breathing in your sleep for one night. Completing an online questionnaire about your sleep habits, biological rhythms and daily functioning. Completing an online questionnaire about memory and concentration. Most importantly, by participating in this study, you will play a valuable role in helping us to understand better how sleep and circadian rhythm disruption affect our health and well-being—knowledge that can be used to design new sleep-related interventions to prevent diseases like diabetes, heart disease, cancer, and brain diseases like stroke and Alzheimer’s disease. In doing so, you will make an important contribution to improving the health of Ontarians for generations to come.